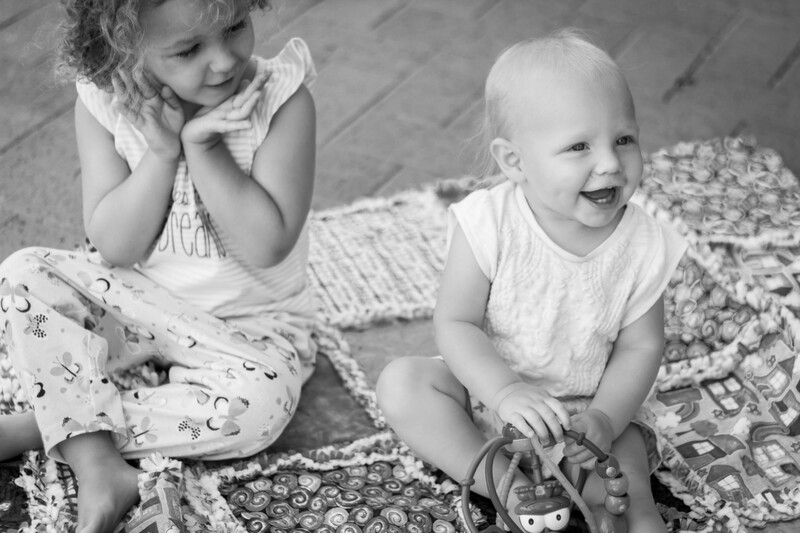 After reaching a point a few years ago where my children were quite independent and I had plenty of ‘me’ time, it was quite a shock to my system to go back to having a baby and having virtually no time for myself. However, I knew that finding a little time for me was important for both my personal wellbeing and my family relationships (I could get quite cranky without it). 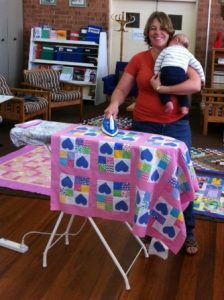 So, here are my top 5 tips for finding time to quilt when you have a baby and/or young children. Depending on your child you could get anywhere from 15 minutes to 3 hours at a time to work on a project. If you have all your supplies, tools, fabrics and pattern in one place ready to go then you can take advantage of even small amounts of time. If you don’t have a space where you can set up a work area and leave everything out in between sewing times, keep everything together in one container that you can quickly pull out and pack away again as needed. I often use large, zip lock, plastic envelopes from office supply stores such as Officeworks to hold my pattern, templates and fabrics. This also means you can easily pick up where you left off if it has been a while since you last managed to spend some time on your project. As your baby or child settles into a routine you will probably have some idea of when and how long they will sleep/nap for, allowing you to gauge how long you will have to work on your project. 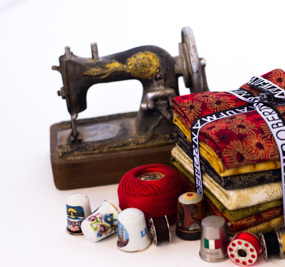 Break your project down into small components (eg cutting the fabrics, fusing all the applique shapes) and plan which of these activities you will do during the next nap period. 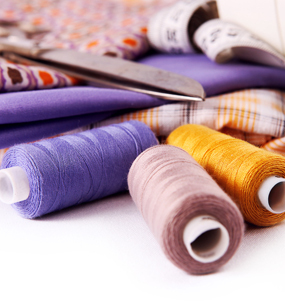 This can be even more important if you work in paid employment as well as being a parent, as you may only have the evenings and weekends to quilt. 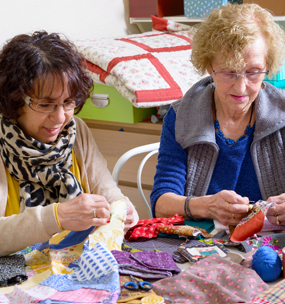 Think about whether there are activities you can combine to help maximise your time, such as hand stitching while watching telly with your partner in the evenings. 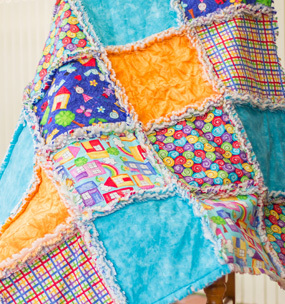 Or spend some time pre-cooking enough meals for a couple of days so that you can spend bigger chunks of time quilting or embroidering on the weekend. You may be surprised how inventive you can become. Different things can, and will, impact on your child’s routine on different days and as they progress through different stages. For example, you’ve probably noticed that when your baby is ill it can throw their routine out completely, and often they never go back to exactly the same routine. Sometimes you might not be well yourself, or it may be more beneficial for you to nap while your child is sleeping. Be aware that some days, regardless of how organised you are and how well you have planned everything, other things may take priority (such as having a nap yourself). If this is the case, adjust your plan accordingly. Mind you, some quilting activities can be accomplished one handed if required! I don’t know about you but if I have 30 minutes of free time I will try to fill it with at least an hour’s worth of activity. Then I get frustrated and discouraged because I can’t accomplish everything I wanted to. Be kind to yourself by being realistic about what you can achieve in the amount of time you have available. Are you trying to be Super Mum (or Super Dad)? It’s ok to ask for help sometimes. This could mean asking for help with housework or sending someone else to the shops for the groceries. You might consider setting up an arrangement with a friend where you take turns babysitting for each other. It’s also ok just to ask for a bit of ‘me’ time when you need it. And if someone is kind enough to offer some help, even though you haven’t asked, then take them up on it. You can always repay the favour down the track. If you have any other tips or suggestions please share them in the comments below. We’d love to hear them.